This book is the true story about me and my battle with leukemia and, (spoiler alert) in the end I die, so you could just read this sentence and then pretend that you read the whole book. Unfortunately, there's a secret word somewhere in this book, and if you don't read all of it you won't find out the secret word. And then the people in your book club will totally know you stopped reading after this paragraph and will realize that you're a big, fat, fake. Okay, fine. The secret word is "Snausages." And with that crazy introduction, you know this book is not going to be your typical memoir. If all you think of when you hear the word Beyonce is the breakout star of the girl group, Destiny's Child, or "married to rapper Jay-Z", then clearly you've never heard the name Jenny Lawson because she gave a whole new meaning to the name Beyonce. Does Giant Metal Chicken ring a bell to you? If it doesn't, clearly you've never read Jenny's hilariously irreverent blog, The Bloggess. 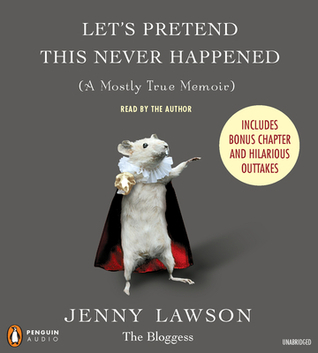 I am pretty sure Jenny Lawson would be in a nuthouse if she weren't so darned funny. Luckily for her, humor can sometimes mask insanity. So as long as she's entertaining people, who's she going to hurt, right? Then again, I probably shouldn't poke fun at her mental health given her long struggles with this very issue but, y'all, this is the craziest book I have ever listened to. It's 300 pages insane of babbling but at least it's funny, insane babbling. I mean seriously, the whole book is just one long, crazy stream-of-consciousness. And I'm pretty sure this book has something to offend everyone: expletives, highly mature themes, irreverence for topics that one does not normally joke about (case in point, the leukemia joke in the intro), and yet despite the fact that the reader is convinced that they should somehow be offended by at least some of the content of this book, they're too busy wiping the tears from their eyes from laughing so hard to worry about whether they actually find the material offensive. That's the mark of a great comic I guess: when you know you should be offended but you're too busy laughing to wonder what it is exactly you should be offended by. No one is going to accuse this book of being a literary masterpiece any time soon -- frequent overuse of the word "totally" does not a literary author make -- but Lawson "totally" has the entertainment market licked. If you're in search of some brain candy, search no further. The audiobook has the added benefit of bonus chapters and outtakes that prove even further the crazy snowball effect that manifests from her stream-of-consciousness way of thinking. I never knew stream-of-consciousness was something you could be talented at, but apparently Lawson is more talented than most. If you're a fan of audiobooks, I highly recommend listening to the audio as opposed to reading the book. Since it's read by Lawson herself, you have the added benefit of her tone and cadence to go along with her insane prose. If you are in need of a good laugh -- one that burns a lot of calories and induces tears -- and you don't offend easily, go out and listen to this book. I have been meaning to read this book! Thanks a lot to your review. I am more convinced to read it.